WASHINGTON (CNN) -- The Obama administration Monday released nine previously secret internal Justice Department memos and opinions defining the legal limits of government power in combating terrorism. 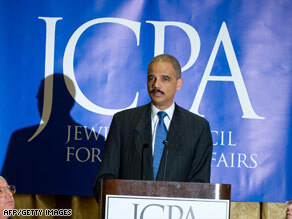 Attorney General Eric Holder says the government can fight terrorism while also honoring the Constitution. The Bush administration had refused to make the documents public, rejecting demands from congressional Democrats. The release ends a tug-of-war over copies of controversial legal guidance from the post-9/11 period that advocated greatly expanded executive power to combat terrorism. Among the documents from the Justice Department's Office of Legal Counsel (OLC) is a 2001 memo declaring that in terrorism cases the military may conduct searches in the United States without a warrant if approved by the president. The October 23, 2001, memo was sent to then-White House Counsel Alberto Gonzales. Gonzales later became Bush's attorney general. As the debate grew over the Justice Department's aggressive legal approach to dealing with terrorism suspects, the Bush administration's views evolved. In another released memo, the head of the Office of Legal Counsel, Steven Bradbury, in October 2008 warned that "caution should be exercised before relying in any respect on the memorandum" written by Yoo. Bradbury advised the Justice Department that the 2001 memo "should not be treated as authoritative for any purpose." President Barack Obama had promised a review of the disputed documents to determine whether they could be released. Attorney General Eric Holder issued a statement Tuesday saying, "Americans deserve a government that operates with transparency and openness. It is my goal to make OLC opinions available when possible while still protecting national security information and ensuring robust internal executive branch debate and decision-making." Earlier Monday, in a speech to the Jewish Council on Public Affairs, Holder said, "There is no reason we cannot wage an effective fight against those who have sworn to harm us while we respect our most honored constitutional traditions." Bush administration critics charged the "war on terror" led to an erosion of an array of constitutional rights. The First Amendment right to free speech was among those addressed by Yoo in his 2001 memo. "First Amendment speech and press rights may also be subordinated to the overriding need to wage war successfully," Yoo wrote. He said the "Supreme Court has recognized that the government's compelling interests in wartime justify restrictions on the scope of individual liberty." Yoo also said wiretaps without court-approved warrants may be needed. In another memo, written in 2002 by then-Assistant Attorney General Jay Bybee, legal justification was presented to support "extraordinary rendition," a practice that allowed the U.S. to transfer terror suspects to other countries where torture was allegedly used. The memo said al Qaeda and Taliban detainees picked up on the Afghanistan battlefield were not entitled to rights granted by either U.S. law or international treaty including the Geneva Conventions, which prohibit torture.